Dorothy Wagner Cook of Granbury, TX was born October 28, 1930 in Tyler, Texas to George and Minnie Lee (Lucas) Wagner. 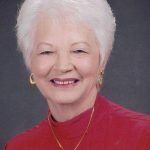 She passed away September 10, 2018 in Granbury. Graveside service: 2:00 PM, Thursday, September 13, 2018, Dean Baptist Church Cemetery, Tyler. Visitation: 6:00 PM – 8:00 PM, Wednesday, Wiley Funeral Home, Granbury. Dorothy married Hardy Cook, Jr. September 13, 1951 in Texarkana, Arkansas. The couple settled in Kermit, TX. In the early 1960’s, Dorothy went to work at Kermit State Bank, retiring in 1989 as a senior vice-president. In 1992, Dorothy and Hardy moved to Pecan Plantation in Granbury, TX. Dorothy is survived by her husband, Hardy, of the home, one son Guy and wife, Lisa, one grandson, Alan Cook and wife Katie, one granddaughter, Allison Doll and husband, Jim, and three great-grandchildren, Sloan, Call, and Cord Cook, all of Yukon, OK. She is also survived by one sister-in-law, Billie Crabtree, of Tyler and several nieces and nephews. Dorothy was preceded in death by her parents and three sisters, Naomi Davis, Louise Leonardt, and Helen Luther. Honorary pall bearers will be Alan Cook, Jim Doll, Raymond Taylor, Larry Lowe, Mike Whisemant, David Lowe and Jeff Lowe. Be the first to share a memory of Dorothy .